The free movement of people and goods, a principle central to the idea of a confident, unified, liberal new order, is under attack, threatened by a growing public revolt against immigration from the Middle East and Africa. While the number of migrants has fallen sharply in recent years, public anger has not, and the question remains whether Europe can preserve its borderless domain and, in a sense, its reason for being. The issue burst into the headlines this week when Germany’s interior minister, Horst Seehofer, a conservative Bavarian, threatened to resign unless Chancellor Angela Merkel agreed to create something like a hard border between Germany and Austria. Under European rules, migrants are supposed to remain in the country where they first landed, but once they are there — inside the Schengen zone — they can travel freely to where they really want to go, which is very often Germany, Sweden or Austria. Ms. Merkel refused at first, saying that would produce a cascade of hard borders in other countries, destroying the Schengen zone. Migration, she said, needed a European solution. In the end, to preserve her coalition, Ms. Merkel agreed with Mr. Seehofer to speed up asylum procedures and turn back asylum seekers who are already registered in other European countries. As part of that deal, Germany would run camps along the Austrian border to assess their status and arrange their deportation if necessary. The German deal came into sharper relief on Thursday night after the Social Democrats, Ms. Merkel’s other governing partners, signed off on it on the condition that instead of in new camps, migrants would be processed in existing police stations along the border and that they would be held for no longer than 48 hours. In addition, Germany will pass an immigration law by the end of the year that gives would-be immigrants the chance to apply for a work visa. Still, many details remain to be resolved, not least agreements with other countries to take back migrants who do not qualify for entry to Germany. Mr. Seehofer came to Vienna on Thursday to begin discussions with the Austrians, while the Hungarian prime minister, Victor Orban, was in Berlin meeting with Ms. Merkel. Mr. Kurz said he had been a critic from the start of the 2015 decision by Ms. Merkel, to welcome in Syrian refugees, prompting more than 1.4 million people to stream on foot through Europe. He and other conservative and populist leaders — Mr. Orban; the Italian deputy prime minister, Matteo Salvini, and Mr. Seehofer — have recommended a series of measures to control Europe’s borders: to set up screening facilities for migrants outside Europe; to return those rescued at sea to the country of embarkation; and to decide, country by country, who will be allowed to come to Europe — including, he emphasized, legitimate refugees fleeing war and persecution. Once dismissed as inhumane, all these ideas were endorsed by European leaders last week in Brussels, he said, though so far, no country outside Europe has agreed to set up centers for migrants and no country inside Europe has established transit centers where migrants can be held and screened to see if they are legitimate refugees. But Mr. Kurz’s idea of patrolling the Mediterranean and systematically returning migrants to the countries — now reinforced by the ascension of a populist government in Italy that is turning back ships bearing migrants, raises moral and legal questions. Returning asylum seekers to countries in chaos or that are judged to be dangerous also violates international law. Mr. Kurz acknowledged that, but emphasized that the European Union had taken steps that had reduced the numbers of migrants significantly, including the deal Ms. Merkel had cut with Turkey. “It shows that it is possible to reduce numbers dramatically, and now we have to go further this way,” he said. Officials estimate that 300 to 600 migrants cross the German border a week, with half of them registered elsewhere. Germany gets about 6,000 asylum seekers a month now, half of whom are estimated to have been registered elsewhere. Indeed, Mr. Seehofer acknowledged on Thursday night that the number of migrants he expected to be processed in police stations along the borders would amount to no more than three to five people a day. 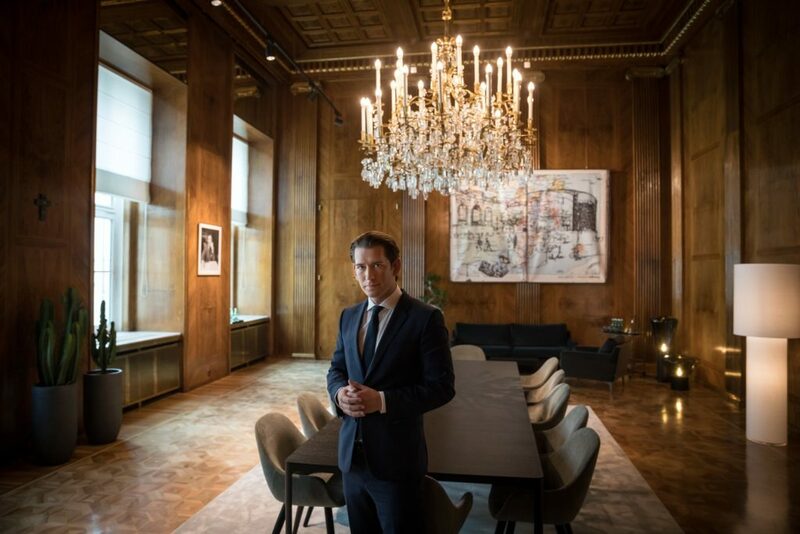 Still, populists like Mr. Kurz, echoing counterparts in neighboring countries, warn that even if the numbers are down now, a new surge could come any time, and so the borders must be reinforced immediately. There are a lot of difficulties with the global asylum system, said Elizabeth Collett, director of the Migration Policy Institute Europe, a study group. “But the idea that there is something wrong about claiming asylum in Europe — that’s quite a shift from a group of countries that created the Geneva convention 60 years ago” that governs refugees, she said. Mr. Kurz’s focus on external borders is too simple when Europeans cannot agree on a common asylum policy, Ms. Collett said. “It’s not just about what happens on the border, but what happens after the border,” she said. Europe’s border dilemma was on display in Berlin on Thursday, where Ms. Merkel stood side by side with Mr. Orban at a news conference. Pierre Vimont, a former French ambassador to the United States, said it was often overlooked that the Schengen system allowed the reintroduction of national border controls as a temporary measure. Such controls have existed for some time between France and Belgium and France and Italy, too. “If this can appease some of the populists for the moment, so be it,” Mr. Vimont said. “So we can say we’re still inside the Schengen system,” he said. “It’s not very satisfactory but it’s a way of dealing with current pressure.” But temporary measures tend to last, he conceded. He noted that the open-border zone, like the euro, was only half-built. European leaders eliminated internal borders without reinforcing external borders — because that was expensive, or touched on the sovereignty of countries like Greece and Italy or simply because they did not foresee the problems of terrorism or a migration crisis like 2015. Whether that will change it beyond recognition is anyone’s guess.